The Sept. 17, 1917 issue of the Lake Placid News reveals that it wasn’t just men against women’s voting rights that year, when New York’s suffrage referendum passed three years before it was ratified as the 19th U.S. Amendment. “The wool is being pulled over the eyes of a great many people in the cry that woman suffrage is coming,” she said, adding that the referendum was defeated by states 12 times since Montana and Nevada voted for women’s suffrage in 1914. Yet it did pass in New York, even locally in the town of North Elba, barely. On Nov. 6, the same day residents voted to make this a dry town – making it illegal to sell liquor – they passed the Equal Suffrage Amendment. Yet it was close – 311 to 280 – passing by only 31 votes. In November 2017, as New York celebrated its suffrage centennial, the Lake Placid-North Elba Historical Society board members decided to create an exhibit honoring this historical milestone. 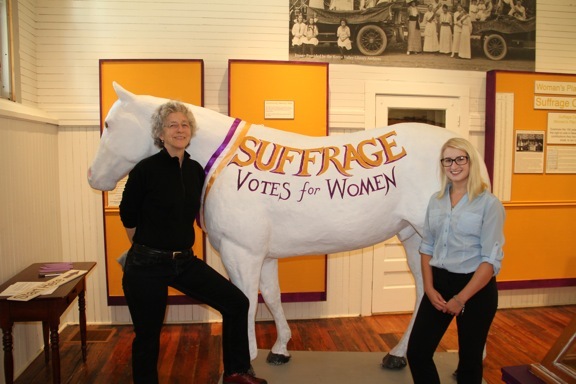 And on Wednesday, June 27, the historical society officially opened “Suffrage Centennial: Women’s Place in Society” at The History Museum in the Lake Placid train depot. “A lot of other museums also are celebrating, and we have a lot of local history that hasn’t been explored yet,” said Courtney Bastian, director and collections manager at the historical society. The exhibit honors New York’s suffrage achievement, yet it also delves into the history of local women in a timeline. The timeline shows brief bios and photos of almost 40 local women from the early 1800s to 2017. Some of the women included in the exhibit are Gloria Allen, Connie Bonsignore, Francis and Louise Brewster, Conni Cross, Carol Hayes, Barbara Kelly, Florence Lamb, Mary MacKenzie, Helyn “Rusty” Hovey McKenna, Anna Newman, Keela Rogers, Judi Strack and Laura Viscome. The timeline also gives descriptions of some civic organizations women had a large part in organizing, such as the Lake Placid Volunteer Ambulance Service, North Elba Christmas Fund, Adirondack Foundation, Garden Club of Lake Placid, Lake Placid Public Library and the Lake Placid-North Elba Historical Society. While visiting the exhibit, Bastian wants people to recognize the achievements of local women on the timeline. “I would like them to appreciate local women’s history more and understand the impact and contributions that women have made to the community dating from the first school teacher in the 1800s up until the present day with the Zonta Club of the Adirondacks,” Bastian said. Tolkan would like the exhibit to have an impact on girls. While doing the research this past winter, Tolkan said she was surprised to learn about the three black boarding houses in Lake Placid, all run by women. Bastian was more surprised to learn that the 4th annual Essex County Suffrage Convention was held at the Lake Placid Club in 1917 and that Melvil Dewey was one of the speakers. One of Bastian’s favorite women on the timeline is Millicent Lengfeld (1893-1960). She was a Lake Placid native who made headlines in April 1918 as the only local nurse to join the Army Nurses’ Corps during World War I. She was assigned to duty in France at the base hospital tending to soldiers who arrived from the battlefields of France and occupied Germany. Bastian also likes Katherine McClellan (1859-1934), a photographer from the town of North Elba and village of Saranac Lake. Born in Paterson, New Jersey, she graduated from Smith College in 1882 and pursued a career in photography. Her favorite subject was the Adirondacks. Her studio was located at the corner of Old Military Road and Park Avenue in Saranac Lake. She produced artistic booklets of the John Brown Farm in North Elba. Growing up, Bastian looked up to her mother for inspiration. “She was a single mother most of my life, and she basically just told us to work hard and be independent and you don’t really need to rely on a man to attain goals and be a strong woman,” Bastian said. Anyone interested in putting a tribute to another Lake Placid woman in the exhibit can share memories, stories and photos on the Community Memory Wall. The History Museum is now open for the summer, from 10 a.m. to 6 p.m. Wednesday and 10 a.m. to 4 p.m. Thursday to Sunday. Admission is $5 for adults, $2 for seniors and free for children and members. For more information, visit www.lakeplacidhistory.com.